Invite a beneficial colony of bats into your backyard using the BestNest Premium Stained Bat House Kit with Pole. 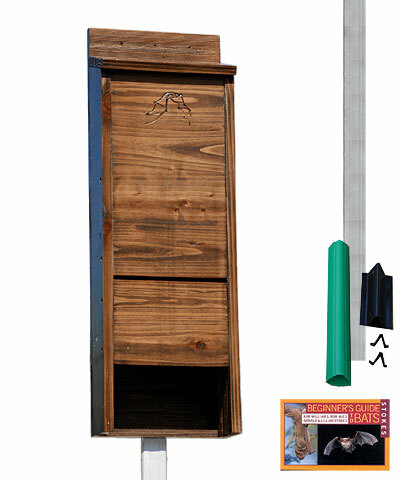 This kit offers all you need to easily place a bat house in your yard. The BestNest Premium Stained Bat House is a lovely and efficient house, meticulously designed to meet the needs of a colony. The interior chamber surfaces and landing platform are crafted from deeply grooved wood, creating an excellent clinging surface for landing and roosting bats. The two chambers each measure 1" deep, offering enough combined space for up to 65 bats. The house's exterior grade stain provides a lovely and natural-looking finish which will help absorb heat while protecting the colony from the elements. The 0.25" ventilation slat in the front aids in regulating temperature and increasing air circulation. The slanted roof has a unique tongue and groove assembly to keep the interior dry and promote better rain run-off. A beautifully designed emblem of a bat in flight adorns the front surface, and the furniture grade wood construction is built to last. Mount this house on the included S&K Telescoping Bat House Pole with Ground Socket with its adapter, and place it in your yard. Once your house is mounted, the Stokes Beginner's Guide to Bats will offer all the information you need to appropriately care for your new tenants. The BestNest Premium Stained Bat House Kit with Pole is a fantastic package for any bat enthusiast.